Climate Common Sense: Nissan Leaf Range Problems! 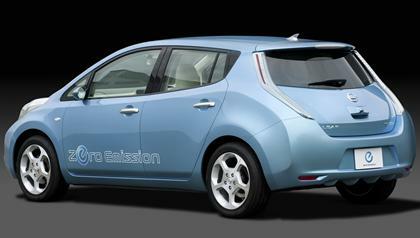 Some U.S. drivers report that they are being left stranded by the Nissan Leaf's undependable range. Jalopnik's Justin Hyde says the car's reported 100-mile range is proving to be fiction. Even worse, the range chart in the car changes during trips to give drivers less range than they thought they would have. Result: The car goes to "turtle" limp-along mode, then dies. "It went from 17 ... to dead in about 5 miles," Jalopnik quotes one report as saying on the MyNissanLeaf forum. We've reported on how Nissan has had trouble producing enough Leafs for owners who have reservations. The range issue is a new one. Nissan said the car would go 100 miles between charges, but the U.S. Environmental Protection Agency rated Leaf as having a realistic range of 73 miles. Jallopnik says many owners on MyNissanLeaf report 60 to 80 miles of range daily.This problem is happening with new cars- I shudder to think what will happen when the batteries start to age! Christopher Booker has more on the electric vehicle industry woes in the Mother Country. The collapse of Modec, the electric van manufacturer, shows how David Cameron's green economy is withering, says Christopher Booker. Things aren’t going too well for the Prime Minister’s boast of leading “the greenest government ever”, giving us, as he said last year, “a real opportunity to drive the green economy, green jobs, green growth”. In 2007, Mr Cameron made a big play of opening a factory in Coventry to build electric-powered vans. Last week, after making only 400 vehicles in four years, the firm, Modec, sacked half its workforce and went into administration with debts of £40 million. Meanwhile, in Australia, ridicule greeted a radio interview with Jill Duggan, a senior British official with the European Commission, who is playing a key role in the EU’s bid to reduce CO2 emissions by 20 per cent by 2020. Taken aback at being faced by two well-informed sceptics, she admitted she had no idea how many hundreds of billions of euros this would cost, or how much it could hope to achieve by way of reducing global temperatures. Nevertheless she claimed that “tackling climate change” has created “over a million new jobs” in Europe, including “many hundreds of thousands in the UK”. Citing a new study which estimates that diverting £330 million into renewable energy destroyed 3.7 British jobs last year for every one created, the interviewers suggested that, with an unemployment rate of 10 per cent, there didn’t seem to be much Europe could teach Australia. The unit still needs some development in terms of mileage capacity. Customers also reported problems in restarting their Leaf vehicles after switching the motor off, and with the ABS braking system. They say that once the driver has released the brake pedals, the brakes remain in full force for some time, increasing the risk of rear collisions. This problem caused a lot of frustrations for its users. While this isn't the worst of mainstream manufacturer engineering faults, it sure tarnished the otherwise good brand. I also buy Nissan Leaf and i am facing same problem.